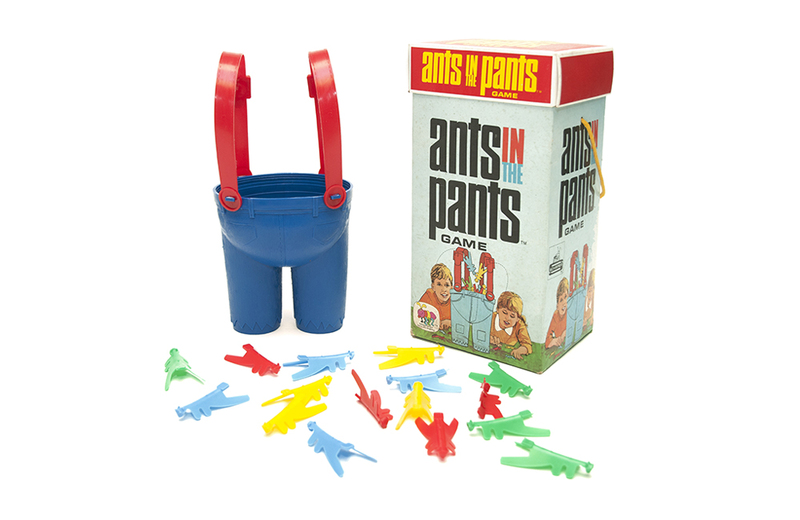 Released by Schaper in 1969, Ants in the Pants is a classic game that still endures with the preschool set, thanks to its simplicity and the fact that a parent can legitimately be beaten at the game by a three-year-old. The game is like Tiddlywinks with an insect theme. The playing surface consists of a freestanding pair of plastic pants (complete with suspenders) and 16 two-inch “ants”, which actually resemble grasshoppers. Two to four players each start with four ants color-coded in red, yellow, blue, and green. Made of supple plastic, the ants can be made to jump in the air by pressing down on a tail. The first person to get all four ants into the pants is the winner. Games can end quickly, with typical playing time checking in around 10 minutes. Over the years, the license for Ants in the Pants moved from Schaper to Tyco Toys to Milton Bradley, now a subsidiary of Hasbro. Pac-Man is turning 35. Here are 7 fun facts about the video game. In the article The Real Santa Claus Was An Eccentric Millionaire Toymaker, OZY.com takes a look at Louis Marx, the man behind Big Wheel, Rock 'Em Sock 'Em Robots, and a myriad of play sets and tin toys.